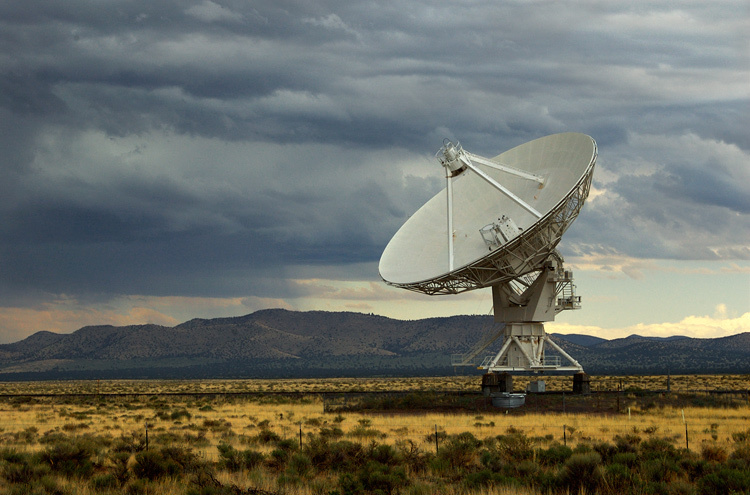 Stormy weather on the Plains of St. Augustine makes an atmospheric background for the VLA (Very Large Array). Should be some interesting B&W 35mm shots of the same storm coming back from the lab any day soon. This is gorgeous! I love the surreality of it. The lighting and toning is beautiful. Great work! This is one of the best nature/technology shots I have seen! I have allways wanted to see these in real life.. And a very nice shot it is, both forground and background is well captured! Amazing view colors, composition, etc, etc. Makes me think of outer space. Exceptionally well done! Keep it up! very wonderful photo indeed ! Thanks for stopping on my site. I looked arround your photo. Nice Site and shoot. I'll comming back soon. Beautiful capture. Tones and light are excellent. Wow. Awesome shot. The composition is great to highlight how awkward the dish rising out of such beautiful nature is. awesome landscapes in your blog!